The Sunday Times Published: 02 October 2011. Lois Rogers. Grey hair may soon become a thing of the past. Scientists say they have found a way to prevent it with a pill. The daily medication, based on a fruit extract, is due to be launched within four years. It is the result of more than a decade´s research at the laboratories of L´Oréal, the cosmetics and hair product company, which hopes to win the race to capture the world´s £8 billion hair colour market. “We have a watertight proof of concept with this, and we think it will have a market among men as well as women,” said Bruno Bernard, head of hair biology at L´Oréal. “We intend people to take it in the same way as a dietary supplement. It won´t be expensive. Ideally you would take it for your whole life, but realistically we would encourage people to start using it before their hair goes grey because we don´t think it can reverse the process once it has started,” he said. Safety trials are being undertaken with hundreds of volunteers around the world to ensure the product has no toxic side effects. L´Oréal acknowledges that its real efficacy will not be proved until it has completed at least a decade of use in the market, because hair-greying is such a slow process. 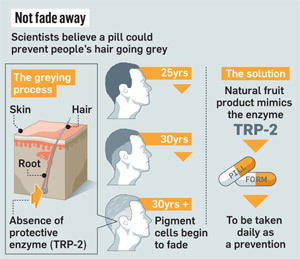 The research team has published papers in specialist journals for experts in cell stress, explaining how the absence of a protective enzyme called tyrosinase-related protein 2 (TRP-2) causes hair pigment cells to die with age. Rather than develop a synthetic drug to mimic TRP-2, which would involve exhaustive clinical trials and licensing approval, L´Oréal screened thousands of naturally occurring compounds that humans are already exposed to. They found one in an unidentified fruit. The product has been developed in secret. Its mechanism will not be unveiled until experts on hair science gather for the five-yearly International Investigative Dermatology meeting in May 2013. L´Oréal wants the meeting to give the product its stamp of scientific validation before it is put on the market. Although a handful of celebrities, including the Hollywood actor George Clooney, have proudly displayed their greying locks, for many people the change is an unwelcome part of the ageing process. In Britain, sales of home hair colouring kits have risen by a third in the past three years. Mintel, the market researchers, say that more than two thirds of British women colour their hair. However, few men use hair dye because the effect can be obviously unnatural – as entertainers such as Sir Paul McCartney, who has fake reddish-brown locks at the age of 69, demonstrate. L´Oréal hopes its new product will overcome this problem by maintaining the natural hair colour. Human hair cells are at their most healthy and vigorous between puberty and the age of 25. After 30, they begin to succumb to a process called oxidative stress, when their ability to defend themselves against toxins diminishes and grey hairs begin to appear. The new pill is intended to protect against this process, though Bernard acknowledges that hair-greying takes decades and it will be many years before it will be clear how well the product works. All the studies are being conducted on humans, because animals are unsuitable: their fur grows evenly and does not lack TRP-2. Des Tobin, professor of cell biology at Bradford University´s Centre for Skin Science, and a leading expert on hair, said: “With people living longer and working longer, they are in the grey zone for longer, and the demand for something like this is huge. Tobin was recognised as the first scientist to identify and grow human hair pigment cells in a laboratory. Although he has collaborated with Bernard in the past, he is now working with rival cosmetic companies, also focused on the lucrative anti-greying prize.